2019 Keynote Speaker: Martin Baron, executive editor of The Washington Post. April 18, 2019 | Cipriani, 25 Broadway, New York City. Main reception 6:00 p.m. | Dinner and program 7:00 p.m. | VIP reception 5:30 p.m. The Overseas Press Club of America is the nation’s oldest and largest association of journalists engaged in international news. Every April, it awards the most prestigious prizes devoted exclusively to international news coverage for an American audience. 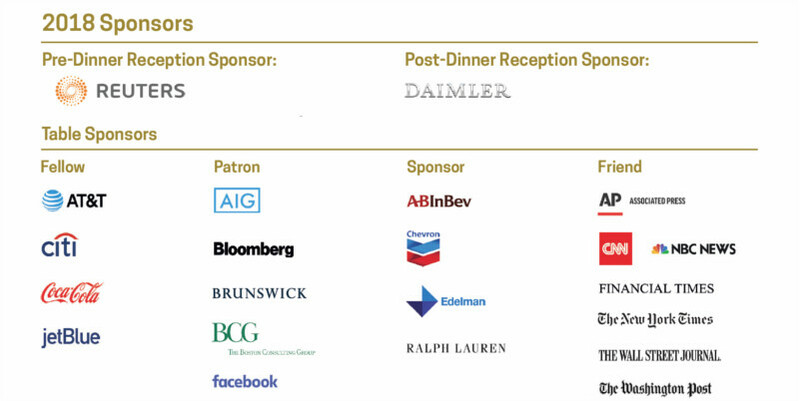 Top editors of all major media companies attend the OPC’s annual awards dinner to network with colleagues and celebrate the work that journalists do covering the world. Foreign correspondents, photojournalists and freelancers fly to New York to collect their prizes. Journalism has become an increasingly hazardous occupation, even as it has grown increasingly crucial to an ever more connected planet. The club’s mission is to uphold the highest standards in news reporting, advance the cause of press freedom, and help educate a new generation of journalists. It was founded in 1939 by nine foreign correspondents in New York City, and has grown to almost 500 members world-wide. Additional $100 per person for attendance to VIP reception (Fellow tables include VIP reception). All table levels include tickets for 10 guests to the dinner, program and main receptions. Fellow table buyers get prime table locations close to the stage, a free, full-page ad in Dateline magazine that is distributed at the dinner and 10 free tickets to the VIP reception. (Individual tickets to the VIP reception are $100 each). Patron tables get priority table locations just behind the Fellow tables, followed by Sponsor and Friend tables.